When Vape and Play opens on Denver's "Green Mile," it will be the second business to allow social consumption of marijuana in the city. The event space and lounge are set to open on Feb. 18, but the owners are already gearing up with soft opening test-runs. DENVER — When Vape and Play opens on Denver's "Green Mile," it will be the second business to allow social consumption of marijuana in the city. The event space and lounge are set to open on Feb. 18, but the owners are already gearing up with soft opening test-runs. Businesses like Vape and Play aim to solve a problem that's existed ever since Colorado voters legalized marijuana: where can people, especially tourists, legally use it? "It's maybe a little different than a ratty couch in a smoke-filled room," said Megan Lumpkins, Vape and Play Chief Operating Officer. "We wanted people to walk into this space and for it to feel familiar like this is a nice hotel lobby, this is a nice restaurant." Lumpkins isn't selling weed, she's selling the experience of enjoying it while socializing. She says that's also why business model for these social lounges can be difficult. Instead, Vape and Play will charge an admission fee for two or three-hour sessions. Many of the sessions will be centered around events like a comedy show, musician or fitness class. “We would definitely want company because Denver could be a tourist destination for cannabis consumption lounges. So, when there’s only two of us, it’s not so much of a destination. We would welcome the company of other licensed spaces too," said Lumpkins. Denver's other social consumption cafe, The Coffee Joint , has been operating since March of 2018. The owners also run a dispensary right next door where they sell product that people can ultimately consume in their cafe. Voters passed an ordinance in the fall of 2016 that allowed businesses to apply for a social consumption license. City officials say there's a demand for places to use marijuana because many tourists and newcomers are surprised to learn they can't walk down the street with a joint. Despite the will of the voters, only two businesses now hold those licenses and Lumpkins thinks she knows why. Her family has been working toward a license for the past two years. "We’ve been tenacious, and when a door shuts we look for another door or we climb in the window. You’ve got to work with legislators and regulators and local law enforcement," said Lumpkins. Her son, Taylor Rosean, brings the cannabis industry experience to the table. As he shows off the new space, he's most proud of a new vaporizer that will allow people to consume while meeting standards for the Colorado Clean Indoor Air Act. 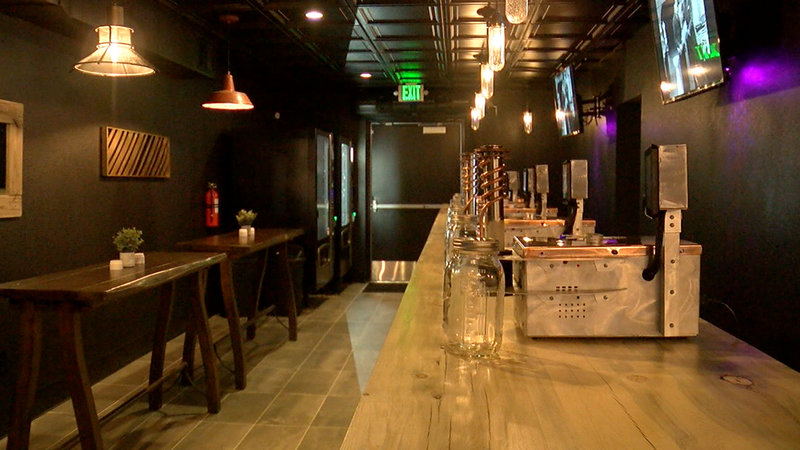 The space feels like a nice bar, but instead of alcohol, you'll find a row of vaporizer machines that Vape and Play had custom-built for its business. "The whole motto of our facility is this is better than your living room," said Rosean. The vaporizer has different settings and a "vape tender" will operate it based on a wrist band handed out to each guest. Patrons will take a survey about their marijuana use before they enter. Based on that survey they will be given a colored wrist band, pink is for first timers, and black is for your avid user. "We basically manipulate the temperature to then affect the amount of cannabinoids that we are vaporizing. So to give an example, a lower temperature will give a lower THC hit so maybe someone with a lower cannabis level can have a more appropriate cannabis serving," said Rosean.